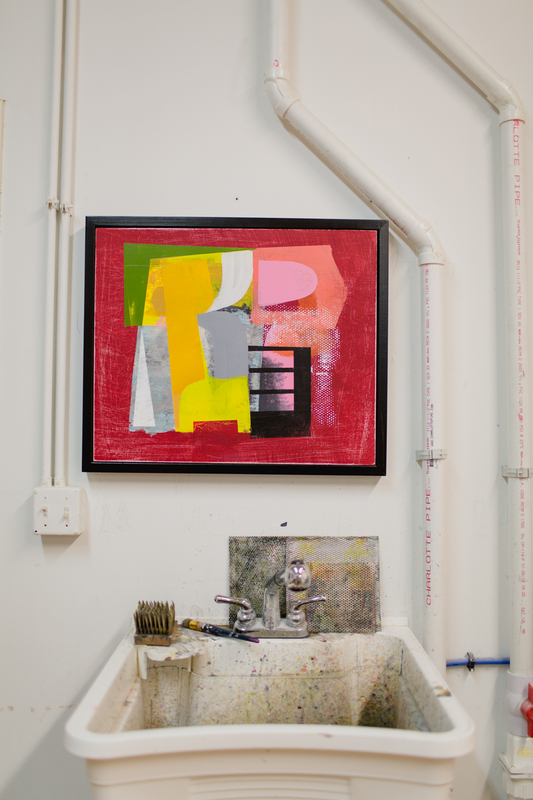 Tom Flanagan's studio is tucked away in the massive Fort Andross building in Brunswick, Maine. 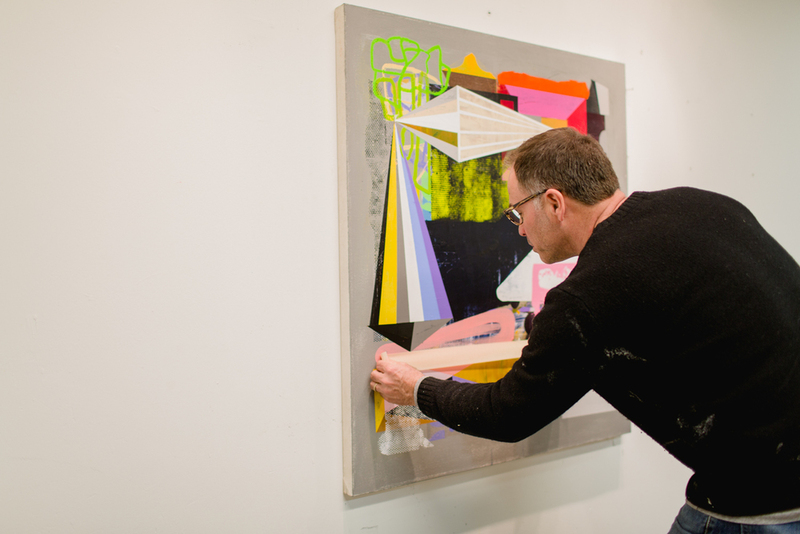 When I found Tom's work, I was immediately drawn to the layers, colors, and shapes and how they all fit together. His work seems both intentional and organic at the same time. 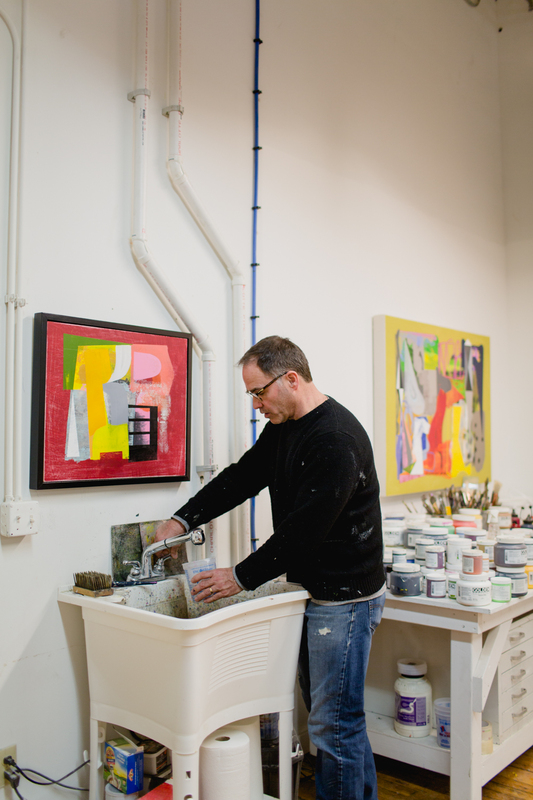 Tom welcomed me into his studio this past spring for a little visit where I got to see how he creates his work. "...my work is more about listening than speaking. It is not about issues external to the visual experience of the work. Ultimately, I make pictures I want to see." Find out more about Tom below! Describe your work in three to five words. Have you always been artistic? Did you grow up in a creative family? If so, how did this influence you and your work/path in life? Some of my earliest memories involved drawing, so I guess that means I’ve been an artist for as long as I can remember. I considered myself to be a professional artist after I got my MFA in Painting 1991. I didn’t grow up in an artistic family but I did grow up in a family that humored me and supported my interests. I spent a lot of time as a young person drawing from life on my own. I felt like drawing was something important even as a child. It was something I could do that set me apart. Did you start out in painting? Did you pursue art in college? I studied studio art in college and started out making sculpture but became interested in painting as my classes progressed. As soon as I discovered abstract painting there was no turning back for me. How long have you been in this studio space? I've been in this studio for about two years. I've had many studios over the years and I like moving into new spaces from time to time. I find the reorientation important in some way. You have such a sense of shape and color. Where do you draw your inspiration from? I’ve been doing this for a long time and I can say as a younger artist I was more concerned with the work of other artists and what was happening in galleries. As I’ve moved forward in my life I’m finding it more interesting to think in terms of my own sensations and how I feel about color and shape and scale independent of current trends and what’s being shown in galleries. I try to get out of the way of the work now. 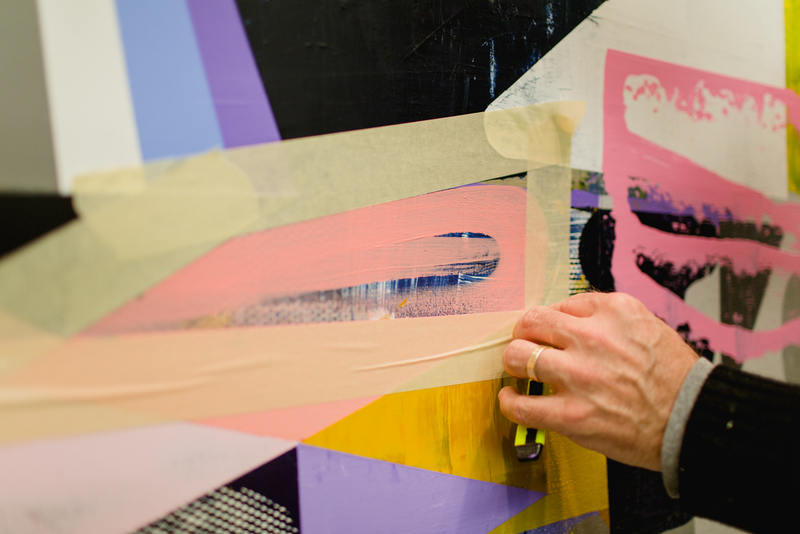 It seems like there are so many layers to your paintings, even though they seem so bold and sure, like you did it all in one session. How long does a typical painting take you? It’s funny. I’m always quite sure I’m going to start and finish each piece in one day but it never happens. Ever. I’ve been thinking for the last couple of years that my process of working must be like what a musician or writer must go through. I think the creative process in general is mysterious so I try to not care how long it will take me to finish a piece. The important thing for me is to stay interested in what I’m doing, otherwise why do it. I generally work on a piece until there’s nothing left to do. 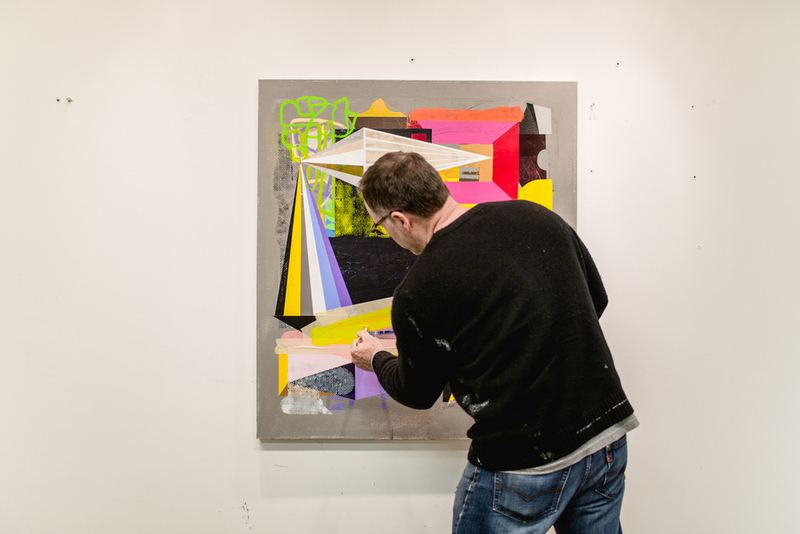 My work has changed a lot over the years although I would say I’ve always been interested in abstraction as a language. How do you balance your art life with family and work? What is the best thing you have ever done for your artistic career? If you were to give advice to your younger self, what would you say? Has living in Maine influenced your work at all? If so, how? I grew up in Pittsburgh, PA. so coming to Maine 20 years ago for the first time was like a revelation. I had no idea how much the natural world would influence my work but it did and still does to some degree. 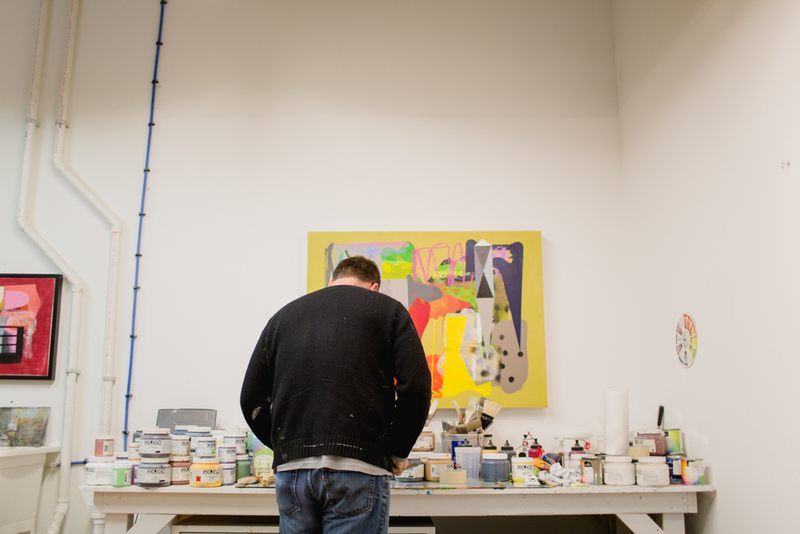 Maine has a lot to offer artists and creative people in general. It’s a very supportive community. What has been the biggest challenge with being an artist? Continuing to make work when no one is interested. I hope to be making work that continues to interest me and hopefully a few other people as well.